I’m incredibly excited about this Shift Shop launch group! 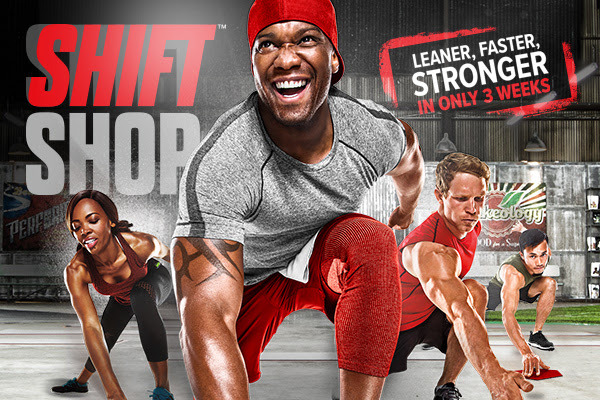 Shift Shop features Chris Downing, Beachbody’s newest super trainer, and is designed to get you leaner, faster, and stronger over just 3 weeks. We start July 24th! Shift Shop is a fitness program for anyone that wants to quickly improve their fitness. The program uses a “ramp-up” method that starts you off slow then gradually increases the intensity week by week. Throughout, you will be refining your nutrition. In Week 1, you start with 25-minute cardio and strength workouts, and a nutrition plan you can stick with. In Week 2, you push a little harder. Workout length increases to 35 minutes, and your nutrition makes a shift so that you are consuming a bit more protein and a few less carbs. Then in Week 3, your shift has kicked into high gear. The workouts become more intense, lasting 45 minutes. And you nutrition gets as clean as it can get. If you’re ready to shift your fitness and nutrition to a new level, fill out the application below and I’ll be in touch to go through the details!